Mrs. Fields treats are perfect for any occasion, from a simple morning tea on the run, a decadent high tea in store with a friend or the centre piece at your next party with their Big cookie cakes! The options are endless. 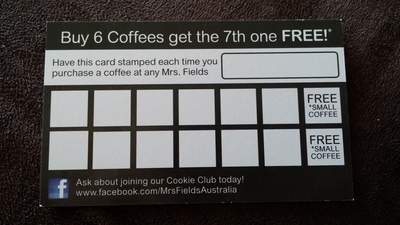 To reward customers for their loyalty, Mrs Fields offer a loyalty card. 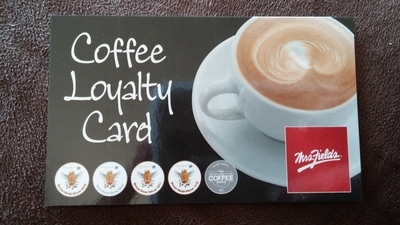 All you need to do is pick up a card in store and each time you purchase a coffee, have the card stamped. Once you have purchased 6 coffees, you will receive your 7th small coffee for free! Buy 6, receive your 7th FREE! The card can be used in any Mrs Fields store - so you are not restricted to one store. For more information on Mrs Fields or to locate your local store, visit their website or Facebook page. Does breastfeeding really help you lose the baby weight?